SECAUCUS, N.J., Jan. 14, 2019 /PRNewswire/ -- Americans have multiple numbers at their fingertips, but some of the numbers that could be most important to their health are not among them. 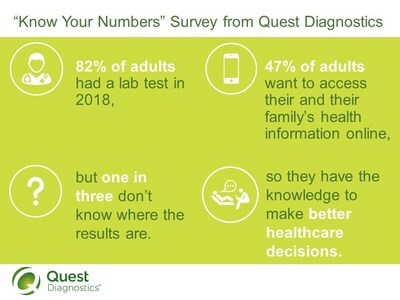 New research released today by Quest Diagnostics (NYSE: DGX), the world's leading provider of diagnostic insights, shows that a majority of adults don't know vital health information for them or their family members, but nearly all would like to be able to access their health information online. Results from the "Know Your Numbers" survey show that more people remember their social media log-ins, current bank balances, Wi-Fi-passwords and even the security code on the back of their credit card than they do important personal health data, including their blood type and cholesterol and blood sugar levels. And, while 82 percent of adults say that they or a family member had a lab test in the past year, about one in three don't keep their or their child's lab results or don't know where they are. The survey examined the perceptions of adults aged 18 years of age and older regarding tracking important information in their daily lives from important numbers and passwords to vital personal healthcare statistics. "Labs are the lynchpin of health, with the majority of healthcare decisions being made on the results of lab tests," said Cathy Doherty, Senior Vice President, Clinical Franchise Solutions and Marketing at Quest Diagnostics. "With consumers increasingly engaged in their own and their loved ones' health care, it's critical that they 'know their numbers' – and have those numbers readily accessible – to ensure productive communication with their healthcare provider for both routine and critical care." Nearly all (94 percent) Americans know their Social Security number, while around three in four know their social media passwords (80 percent), the current balance in their financial accounts (75 percent) or Wi-Fi passwords (74 percent). A substantial gap emerges in knowledge of key medical information. Fewer than three in five (57 percent) Americans know their blood type – something they are just as likely to recall as their childhood phone number (55 percent). And fewer than two in five know their cholesterol (38 percent) or blood sugar (A1C) (33 percent) levels. The percent of African Americans who don't know these numbers is even higher (71 percent and 77 percent respectively). This is particularly concerning given that this population is at high risk for heart disease and diabetes. Forty percent say that they either don't have or are not sure if they have access to their lab test results online, and nearly 20 percent admit that in the past year a health professional has requested their lab results, but they didn't have them available. The vast majority of respondents (87 percent) recognize there are good reasons to have access to health information online, especially in case of emergencies. Despite that fact, nearly one in three keep their lab results in a file cabinet at home. Surprisingly, that is also the case for millennials (aged 20-37) who are known for their highly web-connected lives. In addition to emergencies, nearly half (47 percent) of adults would like access to their health information online to make better decisions for themselves and their loved ones. Consumers Demand More Control Over Their Healthcare. Consumers want to know the information that drives important healthcare decisions and they want to have it available no matter where they are. Recognizing the need to put Americans' diagnostic and lab tests at their fingertips, Quest Diagnostics' MyQuest – a digital platform used by more than six million people to securely see, store and share their results and health information in digital environments – offers the ability to add dependents or other family members through its MyCircle functionality. In cases of managing care for an aging parent or a child, this functionality is increasingly vital, allowing individuals the ability communicate knowledgeably with healthcare provides on their loved ones' behalf. The platform supports Health Records on iPhone and also offers real-time scheduling and QuestDirect, an enhanced consumer-initiated testing service that empowers patients to manage and take control of their healthcare by ordering health and wellness lab testing from the convenience of their home. Available in 48 states, consumers can get the diagnostic information they need to stay healthy in three simple stepsi. QuestDirect's 35 test packages include general health, men's and women's health, digestive health, heart health, infectious disease and sexually transmitted disease testing. "By providing this new avenue for patients to easily order and access lab results for themselves and loved ones, Quest Diagnostics is leading the transformation of consumer health and diagnostics through technological advances" continued Doherty. "MyQuest, including the MyCircle offering, meets consumers where they are by providing accessible lab test ordering and results, which gives them considerably more control over their and their family's healthcare." The online survey was conducted by Kelton Global on behalf of Quest Diagnostics in November/December 2018 among a nationally representative sample of 1,004 consumers ages 18 and older, with a margin of error of +/- 3.1 percent. Quest Diagnostics has been a leader in the movement for consumer empowerment in healthcare. The company has been a strong advocate in the effort to provide patients with direct access to lab testing through QuestDirect. More than six million patients track and access their lab results and health data through Quest Diagnostics' MyQuest website and mobile app. The company further expanded convenient access to testing services through its recent collaborations with Safeway and Walmart and expects to have well over 200 patient service centers in retail store locations by the end of 2018. Additionally, the company provides genotyping test services on behalf of Ancestry's AncentryDNA, a service that today identifies and quantifies an individual's ethnic origins based on results of DNA testing and Blueprint Fit, the first athlete-specific direct-to-consumer service from Question Diagnostics. i Available in OK, AZ and IN through joint venture partners Sonora Quest, Diagnostic Laboratory of Oklahoma, and Mid America Clinical Laboratories. Not available in HI or AK.